Flickr is really slow today. I am trying to upload a photo of a vintage doily. It uses coronation cord as its primary embellishment. Coronation cord hasn’t been made since the 1920’s. 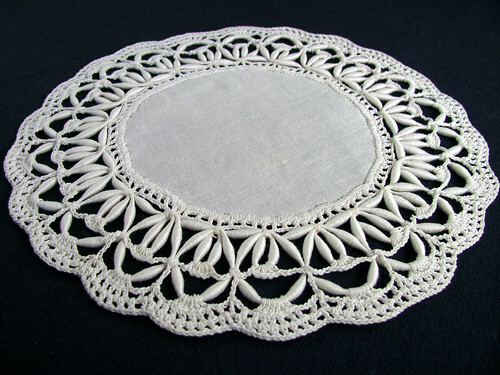 When I found this doily my first thought was to cut out the cord and use it for a project of my own. It bothered me that the center had rather bumpy edges and not an even circle. Something that I would strive for if I had made the doily. Now I think it has a hand-made kind of charm and will let it keep its trim. Currently my projects are not keeping pace with my desire to blog daily. So for a little while, until I am able to get a nice photo of an ongoing project, I will be sharing pieces from my collection of vintage lace. As I am finishing this typing I notice that the photo is now loaded to Flickr. Perfect timing. This entry was posted on Friday, March 6th, 2009 at 4:36 pm and is filed under Crochet and Doily. Tagged: Crochet, Doily, Vintage. You can feed this entry. You can leave a response, or trackback from your own site.